How do you raise awareness of pedestrian safety during Adelaide Fringe? During The Fringe, intoxicated revellers are at particular risk of injury from traffic as they cross, or even stumble onto, city roads. To reduce this kind of injury, drivers were also encouraged to pay more attention, and look for the signs of ‘Wobbly Walkers’. 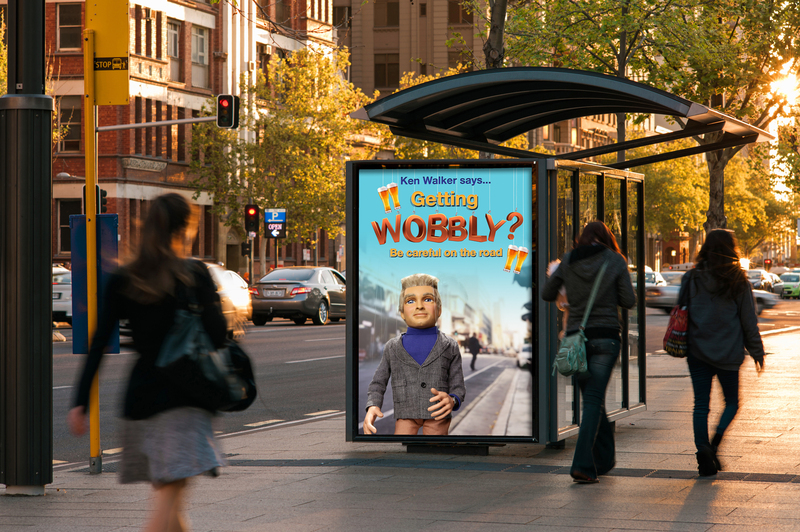 We created a ‘Wobbly Walker’ spokesperson – a wobbly walking puppet called Ken Walker – who explained the campaign message around pedestrian safety in an entertaining way via a wide variety of street/transit and digital media. The campaign has proven to be an extremely effective way of encouraging pedestrian safety, which was still in the fun spirit of The Fringe. Drivers also appreciated the reminder to be additionally aware at this time.